In time for the celebration of the Kadayawan Festival, SmartBro, the country's leading mobile broadband brand under Smart Communications, has unveiled the best and most exclusive deal for the iPad Mini 2. 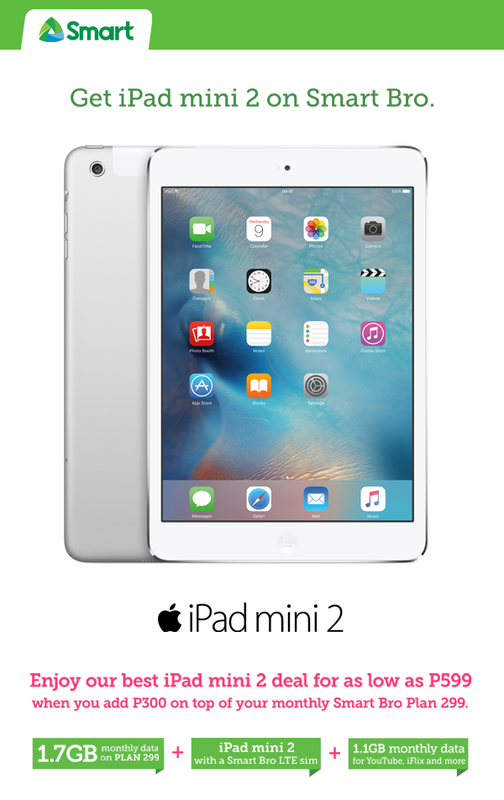 Get the iPad Mini 2 for only P599 per month which comes with 1.7GB monthly data. This is just under the Smart Bro Plan 299 monthly service fee + 300 for the unit. The package includes a free 1.1GB streaming on iflix, Youtube, Dailymotion, and Vimeo for the first three months. The Smart Brokada is promoting the best deals across the country. They conquered Manila, Baguio, Bohol, Cagayan De Oro, Cebu, Ilocos, Olongapo, Zamboanga, Bulacan, and Iloilo. Brokadas Bb. Pilipinas Universe MJ Lastimosa and singer Michael Pangilinan visited Davao in time for the celebration of the Kadayawan Festival. They visited different schools and malls to promote their newest iPad plan.